The diagram shows the summary of Wanderer Butterfly's life cycle, that is typical for insects with abrupt metamorphosis. Abrupt metamorphosis, also known as complete metamorphosis. Beetles, flies. butterflies, moths and wasps develop with complete life cycle. Their young look very different from the adults. Their life style is very different from their adults. Just before they become an adult, they will enter a stationary state. Then their body is completely transformed into a different shape. The larva stage is mainly focus on eating and growing. 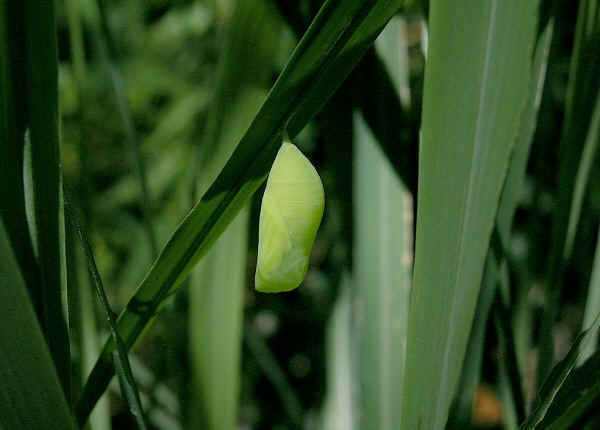 The pupa stage is for transformation and the adult aims at reproduction. 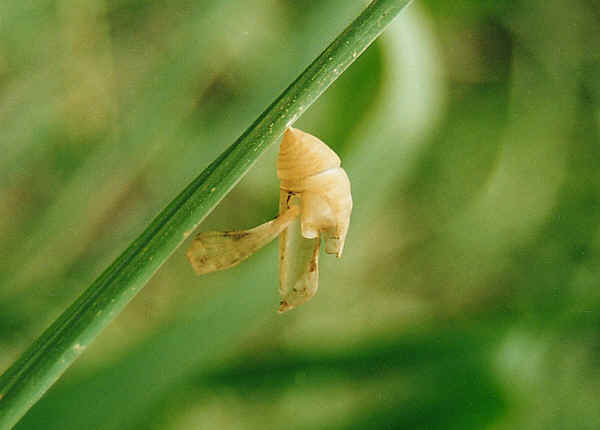 The Evening Brown Butterfly pupa is always found hanging under the long grass. They are covered by dense vegetations and hard to be noticed. Few years ago we found our first Evening Brown pupa. It was hiding in the grasses. When we took the pictures we thought we are very lucky because the sun light just passed all the grasses and shining onto the pupa, which gave the perfect lighting for the photo. Later we found another Evening Brown Pupa and found that our luck was still there. The pupa was shine directly by the afternoon sun light. A pupa photo with good lighting was just easy to take. Then we found that almost all Evening Brown Pupa were shined by the afternoon sun light. We started to realized that this could not be our luck. It could be the Evening Brown Caterpillars had carefully chosen their pupa position.